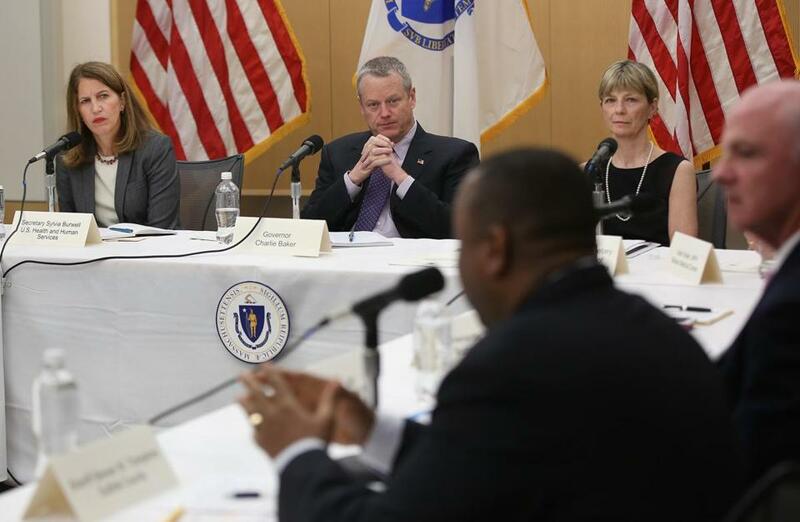 Sylvia Burwell (left), the US secretary of Health and Human Services, joined Governor Charlie Baker and Marylou Sudders (right), the state’s top health official, for a roundtable discussion at Boston Medical Center on Tuesday. More than 1,000 people died from overdoses of heroin and other opioids last year in Massachusetts, according to figures released Tuesday that provide the sharpest portrait yet of an epidemic that has devastated families across the state. The data, released at an event that included Governor Charlie Baker and the nation’s top health official, show that opioid-related deaths increased 3.3 percent in 2014 compared with 2013. More striking, the number of such deaths last year was 33 percent higher than in 2012. The state’s report found that in 2014, 600 deaths were confirmed as opioid-related with an additional 408 expected to be linked to the powerful drugs. The total of 1,008 would appear to be the highest ever recorded in Massachusetts. Stories and data shared Tuesday at a roundtable discussion convened by Baker on opioid-fighting strategies suggest that despite efforts by regulators, law enforcement, and health leaders, every corner of the state is contending with the crisis in abuse of opioids, especially prescription painkillers. While prescription-type opioids still lead to more overall deaths, heroin-related deaths have increased by 172 percent between 2010 and 2013. Read: Jeff Jacoby: What price is too high for a miracle drug? While every county in the state witnessed at least one opioid-related overdose death last year, a few experienced significant spikes, including Middlesex County, which saw an increase of more than 30 percent, from 154 deaths in 2013 to 212 last year, according to the state’s data. “We have seen places in our county where the dealers are doing free Sundays, where they are giving away heroin because it’s so cheap and so addictive,” said Middlesex District Attorney Marian Ryan, whose county includes communities west and north of Boston. She said her office has been encouraging residents to bring unused prescription painkillers to police station drop boxes for safe disposal. And the district attorney is working with realtors to encourage people to remove painkillers from medicine cabinets before strangers stroll through during an open house. State data show that in Essex County, overdose deaths jumped from 120 in 2013 to 146 last year, an increase that is “deeply concerning,” said Essex District Attorney Jonathan Blodgett. “Local law enforcement officials are working hard to identify major drug traffickers and dealers in an effort to get this poison off of our streets,” Blodgett said in a statement. He said he supports programs that allow low-level offenders to seek treatment instead of facing prosecution. “Simply put, we need more treatment options for people trapped in the vicious cycle of addiction,” Blodgett said. The report said Suffolk County, which includes Boston, saw a drop in opioid-related deaths, from 115 in 2013 to 98 in 2014. But a Boston health official cautioned that the state’s figures, which rely on projections for the last three months of the year, may be more optimistic than final figures will show. Baker cited research showing that four out of every five heroin addicts got hooked on opioids through pain medications, many starting with legally prescribed medicine. At the start of his administration, the governor appointed a 16-member working group to submit specific, tangible recommendations to tackle the opioid crisis, with a report expected in early June. The state’s largest private health insurer, Blue Cross Blue Shield of Massachusetts, began an initiative two years ago to craft better practices for treating patients’ pain, including prescribing drugs that are not narcotics. And it more closely tracked prescriptions for painkillers. The program has reduced prescriptions for some of the most potent opioids, but the insurer is still detecting problems, said Dr. Tony Dodek, Blue Cross vice president of medical quality and strategy. When first prescribing pain medication for a patient, health professionals — including doctors, dentists, and nurse practitioners — must consult the state’s Prescription Monitoring Program, a database that reveals if a patient is obtaining drugs from more than one pharmacy or prescriber. Even though that initial check is required under state law, figures indicate many health professionals are not checking the database, probably because it is too “cumbersome,” requiring users to click through various computer screens at least 11 times, said Dr. Monica Bharel, the state’s health commissioner. The state is working on an upgrade, she said. Yet even when health care providers receive the information, they often are not sure how to use it, balancing the need to treat pain with not over-prescribing powerful medications, said Dr. Sarah Wakeman, medical director of the substance use disorder center at Massachusetts General Hospital and a member of the governor’s opioid working group. “We haven’t helped doctors have a rational approach,” Wakeman said. The state’s top health official, Marylou Sudders, illustrated that conundrum for the group, sharing how she was prescribed in February a 60-day supply of Percocet, a powerful, opioid after outpatient surgery. All she wanted to help her sleep that night was two tablets of Ativan, a much milder antianxiety medication. “I was stunned,” Sudders said. For 21-year-old Rebecca Reilly, the road to heroin from prescription painkillers was swift and surprisingly easy, she told the group. “We could buy them off people who had prescriptions,” said Reilly, who grew up in Wayland and has been in recovery since October 2012. Reilly said she was also able to “doctor shop,” feigning the need for other types of prescription drugs while visiting psychiatrists’ offices. *2013 and 2014 figures include projected total deaths, as the medical examiner is still finalizing this data.